(i) Arthasastra written by Kautilya : In Arthashastra, Kautilya explains how a good Govt. should be organised. (ii) Indica written by Megasthenes in Greek : Megasthenes was the ambassador of Seleucus Nicator and spent some time in India during the reign of Chandragupta. In the 4th century B.C. Magadha was ruled by the Nanda kings and was the most powerful kingdom of the north. They had collected a vast amount of wealth in taxes and they kept a huge army. But they were not efficient rulers, so it was not very difficult to overthrow them. Chandragupta Maurya overthrew Nandas with the help of his teacher Kautilya also known as Chanakya (a teacher of Takshashila University). The accession of Chandragupta Maurya to the throne of Magadha in 324 B.C. marks the beginning of the Maurya dynasty. The Punjab had been invaded by the Greek king Alexander in 326 B.C. Alexander had invaded India because some of the northern areas were included in the Persian empire of the Archaemenid rulers. Alexander had overthrown the Persian emperor and conquered his empire. Alexander died in 323 B.C. and the Punjab now ruled by Greek Governors left behind him. After Chandragupta had established his power in Magadha, he turned his attention northwards to the Punjab. Chandragupta soon conquered the whole of the Punjab. Some of the land in the extreme north was held by the Greek general, Seleucus Nicator. Chandragupta fought a long campaign against him and finally defeated him in 305 B.C. Chandragupta acquired the territory across the Indus. There was also a marriage alliance between the two families. In addition, Chandragupta had conquered parts of Central India. So that by the time his reign ended, northern India was under the Mauryas. Chandragupta’s empire extended from Afghanistan in the west to Assam in the east and up to Mysore in the south. Chanakya agreed to serve as Amatya (P.M.) of this unified country with Chandragupta as a king. After ruling for about 25 years, Chandragupta left his throne to his son Bindusara and, according to some sources, became a Jaina ascetic. During Bindusara’s reign, the Mauryan Empire extended as far south as Mysore and therefore included almost the whole of India. Only the region of Kalinga and the kingdoms of the extreme south were not in the empire. Bindusara ruled for about 27 years. In the year 272 B.C. Bindusara was succeeded by his son Ashoka. Ashoka decided to conquer Kalinga and include it within his empire. A campaign was started against the Kalingans who were defeated. But both the armies suffered heavy losses. Ashoka was saddened by the wounded and dying soldiers and the unhappiness that war had caused to the women and children. He declared that he will no longer fight war but will win the people’s heart by dharma. After the Kalinga war Ashoka adopted Buddhism. His life and work showed the path to the humanity. He organised digging wells, building of shelters and planting trees on roadsides. He appointed officers for the supervision of charitable work, founded hospitals etc. He advised people to respect parents, teachers, elders and ascetics and show kindness towards servants and all living creatures. After the 12th year of his reign, to spread these messages not only he did erect pillars engraved with his message but also got it engraved on rocks in different parts of the empire, in places where people gathered together. The edicts were written in various scripts. The majority were in Brahmi which was used in many parts of the country. The language was generally Prakrit. Some of his edicts were also composed in Greek and inscribed in Afghanistan. Ashoka is known as Samrat/Priyadasi. Ashoka in his rock edict xii advised people to maintain harmony in the society by respect for each other and not by criticising each other. He also said that one must learn and appreciate the other’s point of view. He further said that disputes must be settled by talks among the elders of the communities. The Ashokan pillars made of sandstone and were so beautifully polished that they shone like mirrors. On the top of each pillar was carved an animal figure i.e. an elephant or a bull or a lion. The pillar at Sarnath had four lions carved on the top. When India became independent in 1947, it was decided to use this design of the four lions as the national emblem of India. The capital of Mauryan Empire was Pataliputra (Patna). The king was at the centre of the administrative structure and he was assisted by a council of ministers called the Mantriparishad. The whole kingdom was divided into four big provinces. The important provinces were put under the charge of a prince or a member of the royal family known as Kumara. Sometimes trusted officials were also appointed as head of a province. The small provinces were under Rajukas. The departmental chiefs were known as Mukhya (chief) or Mahamatras-the mahamatra in charge of a city was known as nagar vyavaharika ; mahamatra, the officers of civil service were called Purushas and the subordinate officers were called Yuktas. The provinces appear to have been divided into districts which were made up of groups of villages. The city and village administration was separate with different officers responsible for it. The city was administered by a council and six boards which had charge of different departments. Ashoka started a special group of officers whom he called the Dharma-Mahamatras. Forests, mines, wild animals, and other natural resources were considered as public property and protected by law. Trade was regulated by law and people paid various taxes to the Government. Officers were appointed to collect taxes. The standard and quality of goods were also regularly checked by officers. Megasthenes writes that the majority of the people worked as farmers. They either had their own fields or they worked for the king. State also provided financial help to people for agricultural and business purposes. Dams and canals were built for good agriculture. Lake Sudarshan built by Chandragupta Maurya is a good example of that. The herdsmen and shepherds, craftsmen including weavers, carpenters, smiths, potters and others lived happily in the villages and towns. Trade flourished and merchants took their merchandise to every part of the country. Many people were employed as soldiers. They were well paid and lived comfortably. At that time most religious sects belonged to two groups. One was that of the Brahmans and the other was called ‘Shramana’. The Shramanas were the orders of monks of the Buddhist, Jain and other religions who were in disagreement with the Brahamans. The Brahmans and the Buddhist and Jain monks were few as compared to the farmers, artisans and soldiers, but they were respected by everyone. They did not pay any tax to the king. During the time of Mauryas Takshashila, Pataliputra, Kashi, and many other places were great centres of learning. Though Ashoka accepted Budddhism, other sects like Brahmanism and Jainism, were equally respected and patronised. Ashoka believed in social ethics, which could lead people to be peaceful and virtuous. This, he called Dhamma (which is the Prakrit form of the Sanskrit word Dharma) and he explained his dhamma in the edicts. He sent missionaries to five western countries on dhammavijayajatra. He also sent his son Mahendra and daughter Sanghamitra to Sri Lanka for this purpose. The Mauryas also started digging of caves which were served as residences for monks. Some of theprominent caves are in Barabar and Nagarjuna hills. A number of life size stone sculptures have also been found. The most impressive one is that of Yakshi found at Didarganj near Patna. 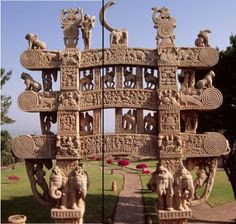 Another artistic achievement of this period is the famous stupa at Sanchi. In every stupa there was a small chamber in which a casket with relics of the Buddha or the Buddhist monks were placed. The surface of the stupa was generally built of bricks with a thick layer of plaster. The stupa was crowned by an umbrella of stone. The monument was surrounded by a fence with a path provided for Pradakshina (circumambulation). The Mauryan Empire began to decline after the death of Ashoka in 232 B.C. There were many reasons. It is said that Ashoka dedicated all his energies and the state’s resources to build a moral society and welfare state. This weakened the army and administrative machinery. Due to this, Indo- Greeks invaded and conquered many parts of northern India. The rulers after Ashoka were weak and could not control the empire properly. The various regions of the empire were cut off from one another by great distances, and this made administration and communication more difficult. The later Mauryan kings could not collect enough taxes to keep a large army and administrative service. Slowly, the various provinces of the Mauryan Empire began to break away and became independent kingdoms. The result of the disunity was that a hundred years after Chandragupta had defeated the Greeks, there was an attack by the Bactrian Greek kings on an Indian king of the north-west. That king had to face the attack all alone, since no other king in India came to his aid and he was defeated. 20 years later the last Mauryan king Brihadratha had lost the loyalty of army. The army Chief Pushyamitra Sunga killed him in 187 B.C. and himself became the king. It was during the reign of Pushyamitra Sunga that the famous Buddhist stupa at Sanchi came in the present form. The period from about the 600 B.C. to about 200 B.C., is marked by far reaching changes in almost every aspect of life in India. This period saw the spread of agriculture over large parts of the country, the rise of cities and the formation of states. The period also saw the rise and decline of the first all-India empire in Indian History. There was cultural unity also. Two major religions i.e. Jainism and Buddhism arose in the sixth century B.C. left a lasting influence on Indian culture. These religions also influenced religious beliefs and practices which grouped together are known as Hinduism. Hinduism as it developed included many Vedic beliefs and practices but had many other features which distinguished it from the religion of the Vedas. This period saw the spread throughout the country of beliefs and practices associated with Hinduism, including Vedic religion as well as Buddhism and Jainism. Alongside these a large number of other beliefs and practices also continued. The Varna system, the system of social organisation converted into caste system, which had arisen in the Vedic age now became well established and gradually became the dominant form of social organisation throughout the country. The rise of cities, crafts and trade also furthered the process of cultural unity. This process was best exemplified by Ashoka. He unified almost the entire country under one empire but renounced the use of war as state policy. Instead he declared the victory of righteousness as the real victory.